Every river cruise and every river cruise line is going to have its own unique features that make it one of a kind. There are so many different river cruise lines that picking just one can feel like a daunting task. That’s why I have gathered this list of the highest-rated river cruise lines available. Now, it will just come down to deciding what destination is most interesting to you and what amenities you’re most interested in. Viking River Cruises pride themselves on not only their beautiful ships but also their land excursions. If you find yourself on a Viking River Cruise, you’ll be visiting renowned museums and notable landmarks, while also getting a closer glimpse at the lives of the locals. On board the ship, Viking also tries to incorporate aspects of the cultures featured on the tour. So, whether on an excursion to Egypt or Asia you’re bound to have a culturally immersive experience. With Scenic River Cruises, there is an emphasis on the flexibility of pace. They offer three different types of excursion packages—active, moderate, and relaxed. These can be upgraded or downgraded throughout the trip based on the needs of the individual. The active package includes longer excursions as well as more strenuous activities like canoeing or bike riding. Whereas the relaxed package offers less strenuous but equally as fun experiences like museum tours and thermal baths. American Cruise Lines is a fantastic cruise option for those of us who can’t afford a plane ticket to a different country on top of a river cruise ticket. One interesting thing about the American Cruise Line is the unique themed tours. Each tour is centered around locations that are going to provide different visual experiences at different times of the year. In the spring and summer, there is a “Tulip Festival Cruise,” which features beautiful blooming tulips and other beautiful foliage. Then, for the fall and winter, there is the “Fall Foliage Cruise,” which is jam-packed full of beautiful auburns and oranges. Finally, all throughout the year, there is the “Eagle Society Cruise,” which is a cruise that explores historical sea-side towns and is known for the immense amount of beautiful animals that can be seen from the ship. If you’re looking for a river cruise to Africa, you have found the one. Of the top-rated river cruises, this is one of the very few with destinations to Africa. But don’t worry, even if you don’t want to go to Africa, this line of river cruises has an extensive list of destinations in Europe, Asia, and even the Middle East. 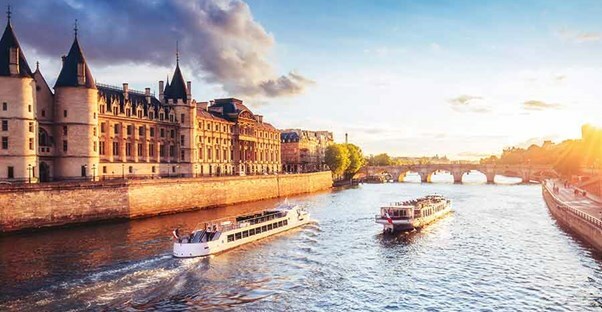 AmaWaterways was founded in 2002 by three industry experts with the shared goal of offering luxury, all-inclusive river cruise vacations for travelers wanting a different type of cruise experience. Today, AmaWaterways boasts more than 22 immersive wine and art cruises. Crystal Cruises also offers different themed tours, but their themes are more centered around the experiences. The “Cuisine, Culture, and Enrichment” trips have a number of different options available with a few of their cruises revolving around music, some around food, and some around dance. The second theme option is “Sports and Wellness.” A few of these trips focus exclusively on sports and games, whereas others focus on the mind, body, and spirit. The third and final theme available with Crystal Cruises is “Spotlight Events and Special Guests.” This theme caters to specific groups of individuals ranging from the official members of the Crystal Sailing Society to veterans to a president’s cruise. You’ll find that while Uniworld River Cruises offer the same destinations as other river cruises, they pay particular attention to the small details. Uniworld truly does their best to distinguish their experiences from all others. Staying in one of these distinctly Regal style rooms will be sure to make you feel like royalty. Not to mention the in-suite butlers, complementary Hermès bath and body products, and 24-hour room service. All of that luxury happens without even stepping out of your room. Uniworld continues to go above and beyond with all of the intricate details, which can be seen in their excursion experiences.